We were in London recently but sadly, our hotel did not have a pool. We wish we’d seen this piece from Forbes.com about hotel day spas in London. All of the hotels mentioned but one have pools. So, for the price of a spa treatment, access to some of London’s nicest hotel pools can be yours. In checking out the piece, we noticed the The Berkeley, in Knightsbridge was like the only hotel listed with an outdoor pool and when we dug deeper, we were delighted to find this! 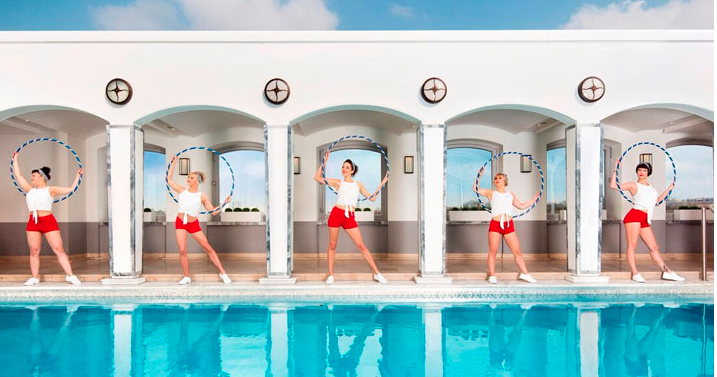 It’s the first hotel pool we’ve heard of with a hula hoop fitness class! Free for hotel guests, Hula-Fit® is a 60 minute cardio workout targeting core muscles, designed for all levels. Non-guests can pay 65 pounds and enjoy 2 hours of pool time after the class. Classes are every Wednesday from 11am to noon, June through September. Sounds like a bloody delightful way to spend a summer afternoon.